REUSABLE BINS MAKES THE BUSINESS CASE FOR SUSTAINABILITY EASY! Due to increasing public awareness of climate change risks and natural resource depletion, consumer preference for local and sustainable products, and stricter environmental regulations, more and more businesses are going green. Whether you are a small business owner or a corporate sustainability manager, we make your business case for sustainable moving easy. 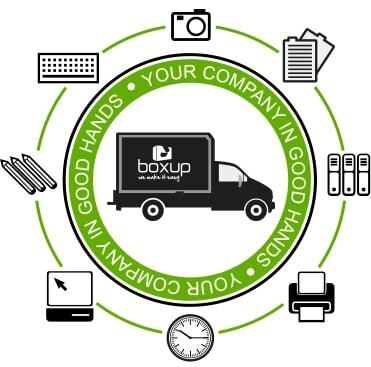 We will deliver the reusable boxes to your office and pick them up at your new location when you are done unpacking. Our durable boxes stack and interlock neatly for an easy and safe move. When empty, they can be nested up to 20 boxes to save space. Made out of recycled content so it’s easier for the environment. Made in the USA (except zip-ties), thus have a smaller transportation carbon footprint compared to imported products. Cleaned after each use with eco-friendly methods. Built to be reused many times, producing significantly less waste to society compared to cardboard boxes or low-grade plastic crates. Our crates are designed to be reused approximately 300 times. Conservatively assuming that a cardboard box is reused three times, it would take 100 cardboard boxes to do the job that a single BoxUp crate does over its lifetime. We are cost competitive to cardboard box providers and other plastic box rental companies. Please contact us to let us know how we can help!